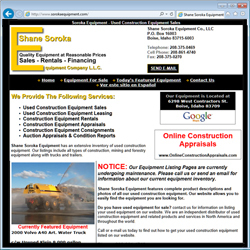 Project scope: Shane Soroka Equipment Co. L. L. C. is owned and operated by Shane Soroka who has a long history and experience in heavy construction equipment ranging from heavy construction financing and leasing, to auction business and at present in the retail business. He has been employed by two major Canadian chartered banks and a industrial lending company with the responsibility of expanding their presence in the heavy construction financing and leasing business. 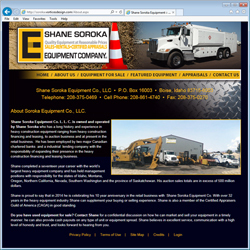 Design components: We built an new site for Shane a few years back for his heavy equipment appraisal business which allows his customers to submit their equipment to him for a market appraisal. His equipment sales site accidently got caught in the retirement of another developer who was no longer available for maintenance and unfortunately it had been developed on an out-of-date platorm back 2004 and it stopped working and we stepped in to create his new site using current database technologies and a much cleaner design.